Your child is wearing a pillowcase. | Sew Lindsay, Sew! Your child is wearing a pillowcase. Now, there’s no denying that the child in the photo is adorable. There’s no denying that the fabric is darling. But… there’s also no denying that this little girl is wearing a pillowcase. I’m completely on the fence about pillowcase dresses. I love the idea of taking one thing and turning it into something completely unexpected. I also love the idea of a sewing trend that is simple enough for a beginner. These dresses have such a loyal following in the sewing world that I have to wonder if there’s something wrong with me. Would I feel differently if I saw one of these in person? Or if I actually tried to make one myself? I want to love these dresses, but there’s a huge barrier in my brain that can’t get past the fact that these children look like they are wearing bed linens. 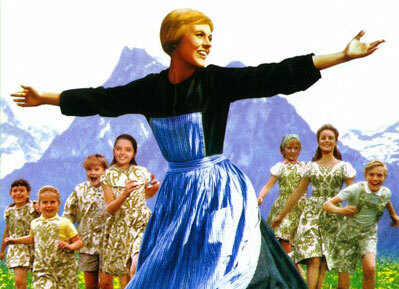 Sure, the Von Trapp children were wearing curtains, but it certainly didn’t LOOK like they wear wearing curtains. I know they weren't REALLY wearing curtains, but still. 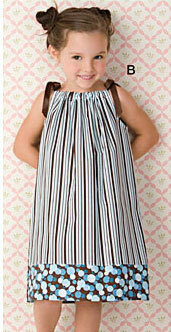 Here’s another pattern included in “Pillowcase Fashions” – a little pants and tank top combo. I think I’d be much more likely to go this route if I ever decided to whip up pillowcase apparel. Has anybody out there ever made a pillowcase dress? Is there something that I need to know that will sway me to the pro-pillowcase-dress side of the fence? Please share! « On a (crayon) roll! I know a few friends who have made them and a TON of people who have put them on their little girls. On the right kiddo, with the right hairbow, they are precious! They can also be insanely overpriced in specialty boutiques when they are “vintage” That sound is me rolling my eyes. I think this woman’s blog (an Arkansan!) features her baby girls in pillowcase dresses.